A year of researching obscure World War 2 era archival materials has paid off for Italian diver Cristina Freghieri and her team of divers. Although looking for a different wreck, the group discovered the intact remains of a Messerschmitt 323 Gigant downed by a Royal Air Force Bristol Beaufighter on July 26, 1943. The wreck was discovered nearly intact approximately 8 miles off Italy’s Maddalena Islands. Only ~200 Me 323 Gigants were produced during World War 2 and none survive today, thus there is a distinct possibility that the plane will be recovered and restored. Earlier this year the German Navy recovered the remains of a Ju 88 from the Baltic Sea with plans to restore and display the plane at the German Historical Museum’s Air Force Museum. The Me 323 Gigant was developed from a glider design the Luftwaffe had commissioned in October 1940. 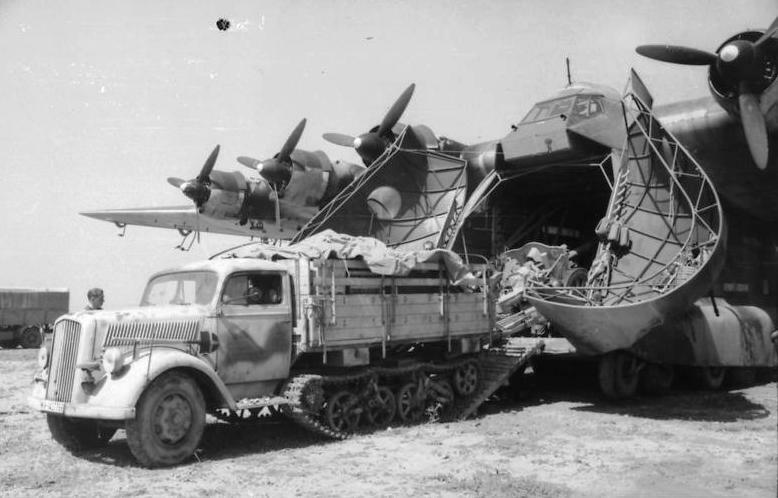 The plane could accommodate up to 100 assault troops or 10-12 tons of cargo (by comparison a C-130 can lift 22.5 tons) in the form of field artillery and its halftrack, two trucks or even the ubiquitous 88mm flak gun. By the time they were deployed in late 1942, the Luftwaffe had begun to lose air superiority and the Gigant often fell prey to Allied fighters due to its slow speed. Due to its low volume of production and Allied air superiority, the Gigant never lived up to its full potential.